Everton chairman Bill Kenwright is a bit of a cowboy - or at least he'd have loved to have been one. He is one of the country's great theatrical producers but I'm sure he secretly longs to be the wandering rider approaching a log cabin with the backdrop of the grey-blue mountains of the Grand Tetons in the opening shots of the seminal 1950's western Shane. In his London office, the man who has produced blockbuster West End hits Blood Brothers, Joseph and the Amazing Technicolour Dreamcoat and Whistle Down the Wind even has the original buckskin outfit worn by actor Alan Ladd who played the lead role hanging on the wall. Shane is a classic and timeless tale of good versus evil - of the small individual standing up against rich, unfeeling businessmen. He wins the final gunfight, but ends up losing his life. He cuts a tragic figure. He knows the days of his like are numbered with the end of the Wild West and the coming of huge wealth to the ranch lands. Bill must feel like Shane when he takes his seat at his beloved Goodison Park where he's fighting the good fight as he has for the past decade. Everton is the love of his life. He still idolises the heroes of his youth. Everywhere in his office there are pieces of memorabilia. Mere mention of Dave Hickson, the "Cannonball Kid" who hammered 95 league goals in 225 games over two spells at the club, gets the chairman all misty eyed. He used to run from school to see Hickson play midweek matches. Like we all do with our heroes, he thought he had a bond with Dave - that the bloodied hero of that epic 1953 FA Cup fifth round win over Manchester United was dedicating each performance to the young Kenwright watching in the Gwladys Street End. Once he even insisted on getting up from his sick bed when seriously ill to get to a home match. If he wasn't there, he reasoned, Hickson would have nobody to score for. The love affair is still burning with the same intensity. In November 2007 when Hickson had a suspected heart attack ahead of a 7-1 win over Sunderland, Bill gave up plans to watch the game to travel in the ambulance with his old hero who turns 80 this month. 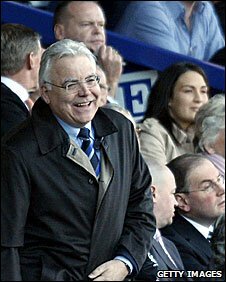 A director of the club since 1984 and chairman since 1999, Kenwright has never let the passion dwindle. He's still the wide-eyed schoolboy fan when he's around the current first-teamers. He still worships his heroes. In the days of the foreign football oligarch investing in the game for profit, he's not in it for the money. There is an innocent charm in that and it shouldn't be scorned. On Sunday at home to Stoke City, he'll be roaring them on from the directors' box with mum and great aunt sitting alongside him. The whole family is besotted with Goodison Park as most football neutrals are. It reeks of football. In every corridor under creaking stands there are echoes of Dixie Dean, the glorious Ball-Harvey-Kendall trio, a young, thrusting Joe Royle, a predatory Gary Lineker, a rampaging Andy Gray. But this is where Bill faces his tragic Shane predicament. It's breaking his heart, but he is the man who wants to take Everton away from the old homestead. To compete in the modern Premier League the club needs the commercial revenue from the proposed new 50,000 capacity stadium at Kirkby. The club's banking advisors Deloitte have said the potential financial benefit of the new ground will be around £6m a season. Goodison can be as achingly wonderful or as dreadfully sad as an elephants' graveyard. Everton were hoping the government would publish the final decision on the 2008 public inquiry into the Kirkby Project at the party conference this week but it didn't happen. 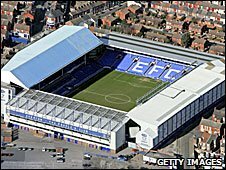 The "Keep Everton In Our City" campaigners, who object to a move outside Liverpool's traditional boundaries, are opposed to Kenwright's plans, though 59% of supporters voted in favour at an unprecedented ballot on club policy. The poll was typical of chairman Bill. Not all fans are wholeheartedly behind him. Many argue that he hasn't given the manager enough money to spend on new players but Kenwright is always willing to have a dialogue. He shares the passions of supporters. He understands them. He does not undervalue them. He also realises, like Shane, that his time is coming to an end. The age of the gunfighter passed and so the era of the chairman-fan is also passing. Theatre productions simply don't pay enough money to fund a Premier League club in the Abramovich age. He has spent 12 months scouring the globe for investors who can help fund the £80m Everton need to part pay for the £400m Kirkby Project. He could have sold out by now. There have been prospective buyers but so far he hasn't been convinced that they are the right kind of people to protect Everton's heritage and future. He refuses to lower his standards or abandon his principles. I hope Kenwright's love for Everton continues. I hope my fears that the unscrupulous money-makers within the sordid world of football politics don't fester his football soul. People like Bill Kenwright are good for the game. He may go a bit tearful and nostalgic at times. Most of the good people do. He may not satisfy all of the Everton fans, but most recognise that he's one of them. The day he goes will be a sad one. It'll be the day I'll sing to myself a lyric from one of his shows - that great anthem from Blood Brothers: "Tell me it's not true. Tell me it's a story". But if he is to ride off into the sunset in his replica Dave Hickson shirt atop his Shane buckskin, he'll deserve a place in folklore and not just football's Boot Hill. Jonathan Pearce will be commentating on Everton v Stoke for Sunday's Match of the Day 2.